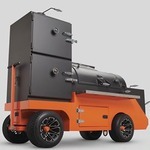 Yoder Smokers Community Forum • View topic - Completion Cooking Timelines??? Post up pictures of your team and cooking setups at competitions to show off your Yoder Smokers products. Share tips, tricks, ideas and custom items you have made to make comps easier. There are many people who do an entire comp on one cooker, whether it is a pellet cooker, stick burner or something burning charcoal. The best suggestion that I can give you is to work backwards from your turn in times and make your decisions on when to start cooking each meat and at what temperature. Then practice your timeline, make adjustments and practice again. Big meats, brisket and pork can cook at the same temperature, and can be held (if done properly) for longer periods of time. Ribs and chicken can also be cooked at the same temperature, but your prep must be spot on to compensate for cooking at a different temperature than your potential optimum. I have seen cooks cook everything at the same temp, and others change it up between the big meats and ribs/chicken. I am no expert, but would suggest that you set your own timeline, and then practice, practice, practice, and document everything.